Dr. Ann Duncan is the chief veterinarian for the Detroit Zoological Society. One of my favorite things to do is assist with work in the field. It is very rewarding to be able to use our veterinary expertise to help animals succeed in their natural habitat. This month, I and Dr. Wynona Shellabarger each had the opportunity to spend a few days near Manistee in northern Michigan, assisting with health assessments of free-ranging martens. The American pine marten (Martes Americana) is an important carnivore species that was originally found throughout most of our state. Habitat loss and overhunting led marten populations to drop to zero by the early 1900s. In 1986, the U.S. Forest Service and Michigan Department of Natural Resources reintroduced 36 martens into the Manistee National Forest. Early monitoring of the released animals indicated that the population was not expanding as expected. Professor Paul Keenlance from Grand Valley State University has been leading research efforts to better understand this group’s habitat range and preferences, breeding success, and the distribution of their young, known as kits. His research team is also working to better understand what they eat and to determine the degree of genetic diversity. 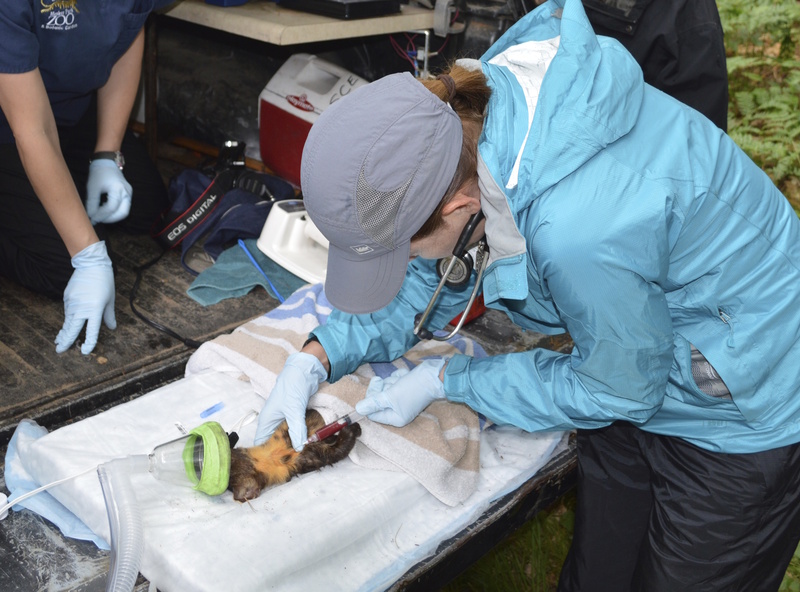 The Detroit Zoological Society’s (DZS) participation is in support of the work Dr. Maria Spriggs from Busch Gardens is leading to assess the overall health of the population. To conduct this research, the martens are captured in what are known as Hav-A-Heart traps – which are humane traps that close in such a way that they do not harm the animal. The traps are set carefully to ensure that martens have a nice snug spot. We cover each trap with pine needles and leaves for warmth and nest building, and put large pieces of bark on top to protect them from rain and snow. We also place meat bait and grapes in each trap so that they have a snack and a source of water. Our visit this spring marked our fifth trip to the field site. A typical day in the field starts at 7 a.m. because we want to make sure that any martens that have been captured do not have to wait long. Each trap is marked on a map with GPS coordinates and we drive from one trap to the next. Empty traps are restocked with bait and grapes as needed. If we catch a marten, things get very exciting. Each marten is given anesthetic gas with a face mask to allow an examination. During the procedure, we measure several parameters to ensure that anesthesia is safe and smooth. We measure body temperature to make sure martens are not too cold or hot. Next, we collect a body weight, perform a thorough physical exam, check the teeth to determine age and check for ticks and fleas. We collect urine, feces and hair samples, and collect blood for an overall health panel and to determine exposure to viruses. Lastly, each marten is fitted with a GPS collar. The DZS provides GPS collars that are able to provide a location every 15 minutes to an hour for many months. During a typical week, we usually catch between five and 10 martens. Each capture expands our understanding of these amazing creatures. The information that has been gathered so far has lead to changes in the management of the forest in which they live, and will be used to inform decisions about marten protection in the future.